Full of intricate beauty, this tapestry "Ponte Rialto" shows Rialto bridge, in a modern rendition by French artist Fabrice de Villeneuve. Rialto is the commercial and financial center of Venice and is known for its famous bridge. The bridge is articulated with arches and architectural decor as seen in this tapestry. De Villeneuve, a Parisian artist who began in his little workshop in Paris, and is now a worldwide known French artist whose works portray romanticism and beauty. Here we see the exquisite use of orange, golds, beiges and browns to create a work that is beautiful and romantic. 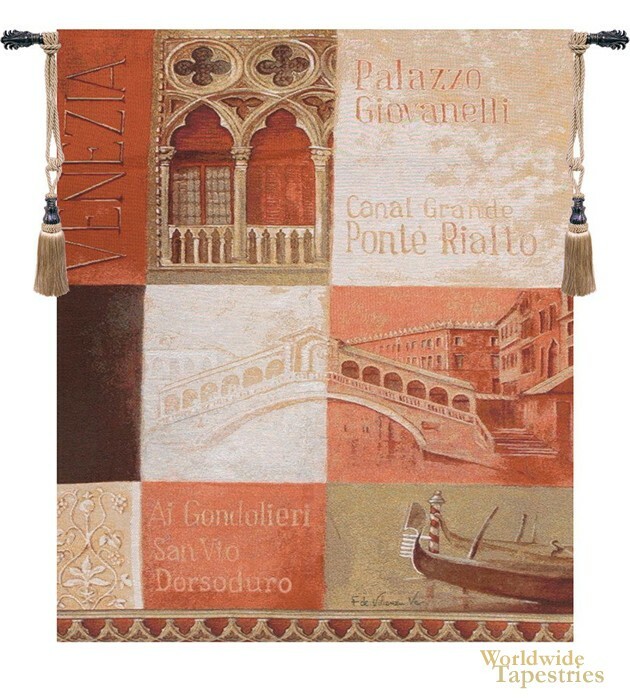 This modern tapestry "Ponte Rialto" is backed with a lining and has a tunnel for easy hanging. Note: tapestry rod and tassels, where pictured, are purchased separately.